He was the law partner of Richard M. Nixon and, when Nixon was elected President, served as Attorney General of the United States. He was a central figure in the Watergate Scandal which drove Nixon from office. He is buried in Section 7-A by virtue of his service in World War II as a Lieutenant in the US Navy and in deference to his cabinet rank. John N. Mitchell was eulogized Saturday as ''not one who attracted fair-weather friends'' in a gathering of friends that included former President Richard M. Nixon, his former law partner and boss, and others from Nixon's administration. 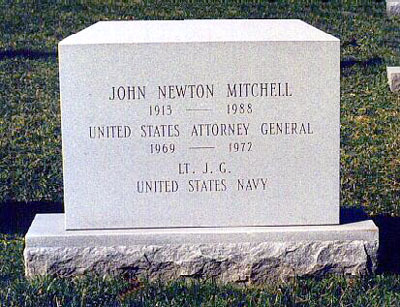 The former attorney general, who won the Silver Star for gallantry for his service in the Navy in World War II, was buried with full military honors at Arlington National Cemetery. Mr. Mitchell died Wednesday at 75 after a heart attack. His bronze coffin, covered by the American flag, was borne on a caisson pulled by six white horses as the Navy band played the Navy Hymn. Seven sailors fired three volleys that echoed through the cemetery, and a bugler sounded taps. At St. Alban's Church, in the National Cathedral complex, Nixon escorted Mr. Mitchell's longtime companion, Mary Gore Dean, down the aisle. But Nixon did not take any part in the service and did not attend the burial. Nixon's wife, Pat, did not accompany the former president. The pallbearers included Mr. Mitchell's five grandsons by two children from his first marriage. Mr. Mitchell was convicted of conspiracy to obstruct justice in the Watergate cover-up trial and served 19 months of a 2 1/2-to-8 year prison sentence. H.R. Haldeman and John D. Ehrlichman, his other co-defendants in that trial, did not attend the funeral. Nixon was one of 18 unindicted co-conspirators in the Watergate scandal. There was only one reference to the scandal at the funeral. ''What he went through was the most unfair, cruel treatment of a public figure in the history of this cynical city,'' said Richard A. Moore, a former aide to Nixon, in the eulogy. Attorney General John Mitchell advised reporters at the start of President Richard Nixon's administration, ''Watch what we do, not what we say.'' Coming from the law-and-order campaign manager with the visage of a bloodhound, that epigram was interpreted as the epitome of political deceptiveness. But his intent was to reassure blacks that, foot-dragging poses aside, the Nixon Justice Department would accomplish desegregation. Mitchell knew that the appearance of a tilt toward white Southerners would ease the way for acceptance of steady civil rights progress for blacks, and sure enough, what he did in this area was much better than what he said. Many of the Nixon clan that gathered for the funeral of Mitchell last weekend understood that abyss between the persona and the man. Dour, stern, taciturn, forbidding on the outside, and warm, loyal, staunch, steadfast on the inside, few public men have so deliberately cultivated the widespread misconceptions of themselves. Yes, this was the first man tossed off the sled for the culmination at Waterg ate of the illegalities that he came to call ''the White House horrors.'' Nobody denies his transgression: The spying plan put forward by the Magruder-Liddy toadies and crazies, which Mitchell reduced but ultimately approved, was plainly criminal, and the former attorney general should have known it. However, the familiar faces of a decade ago were gathered to salute the private John Mitchell. Nixon, Ron Ziegler, Pat Buchanan, Len Garment, Dwight Chapin and Rose Woods were there. 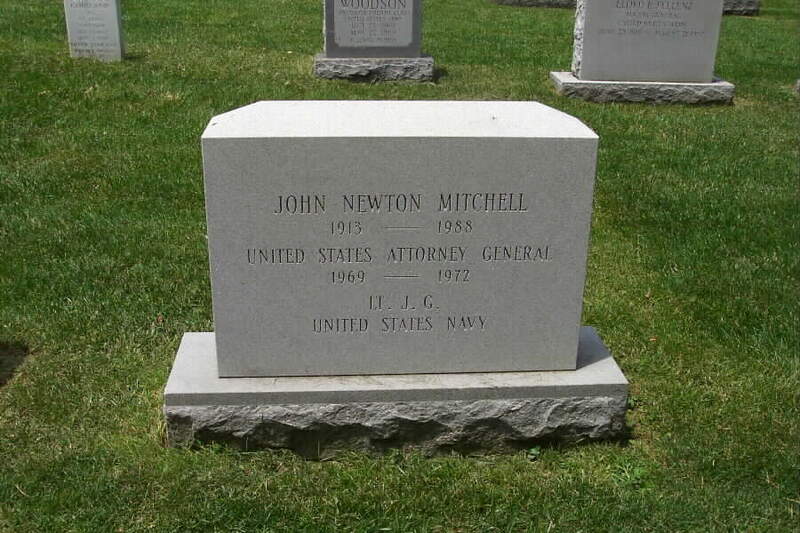 What was it that made Mitchell different from all the Nixon men? In a word: constancy, even through the heat of Watergate's crucible. Through it all John Mitchell remained John Mitchell - a villain outside, often a hero inside. About the hero part. He commanded John F. Kennedy's PT boat unit during World War II. Less well known are his two Purple Hearts for wounds in combat. He never spoke of his war record; exploiting his medals would have been out of character. His friend Richard Moore, in a eulogy, noted that near Mitchell's grave in Arlington National Cemetery was the headstone of Colonel Gregory ''Pappy'' Boyington, a Medal of Honor winner who used to call Mitchell yearly to thank him for saving his life. We had a long lunch the week before he died. Because Mitchell had been the nation's foremost municipal bond lawyer before being asked to manage political campaigns, I wanted his view of the effect of poison-pill defenses on corporate bonds. He thought that all new bonds would have to be drawn with fresh guarantees. He also said tax policy was dangerously tilted to encourage debt at the expense of equity, and that we should cap the deductibility of bond interest while ending double taxation of stock dividends. He stayed in touch with the president to whom he had proven so loyal; the inner fortitude of both brought them back from the depths of disgrace. To paraphrase: Judge constant John Mitchell for the totality of what he did - both right and wrong - and not merely by what his detractors said.